In my ‘other job’, as a script consultant and scriptwriter, I have been lucky enough to be involved in some great shows, including musicals, animated films, TV shows and live-action films. It’s great to see project come to completion and know that you have helped it along the way on that difficult journey. 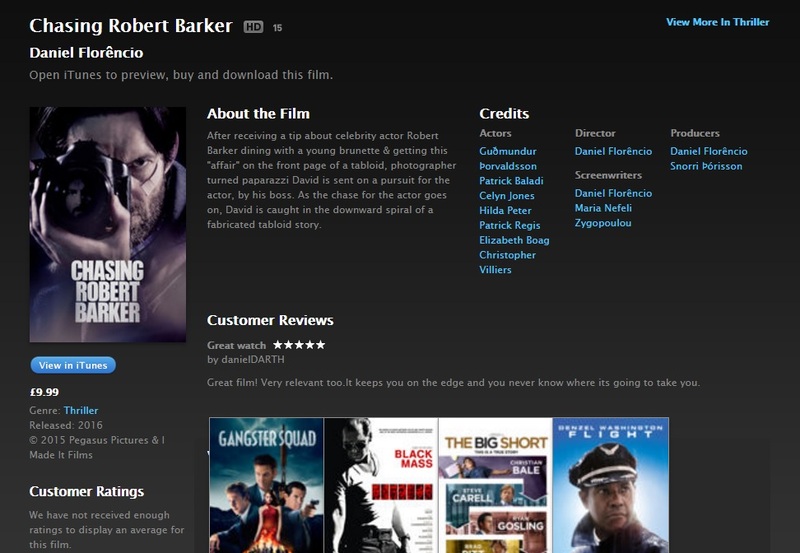 It’s really exciting then to see that one of the feature films I have been involved with, ‘Chasing Robert Barker’ is now available on VOD channels such as itunes. This was a real labour of love for the team who all deserve congratulations for their hard work and shows what can be achieved on even a very modest budget when talent and enthusiasm are involved. I am particularly delighted for the principle writers, Maria and Daniel (who also directed brilliantly) for having the vision and determination to see their project through to completion. I love writing novels and my own scripts of course, but I also love helping people with their projects too and sometimes I do also love that feeling of being part of a dedicated team.